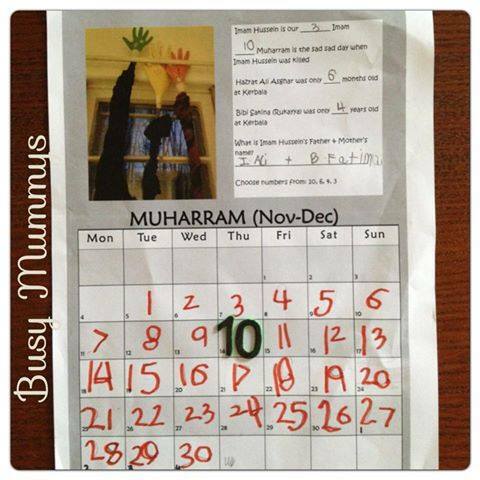 Muharram is here…and so begins our mourning, reflection and Inshallah, change. This year we will be looking at even more ideas that we can implement to share this with our children, Inshallah! How about this calendar from www.busymummys.co.uk? We nearly missed a couple of very important dates last year. So this year, we’re trying to make a conscious effort in knowing the Islamic dates as much as we know the Gregorian calendar. We made an A2 kitchen wall calender,consisting of a pic, a calendar activity and the calendar itself, that is filled out by kids. A great way to practice number writing and counting for little ones. The A4 calender in the picture was solely for the purpose of this post, as the A2 calender contains personal information. We use the A2 as the main family calender with appt dates, our schedule, smiley faces, sad faces, birthdays etc.. Whenever the new moon sights, we will sit down to make a new calender for the month. A great way to show kids when birthday parties they’re invited to coincide with Islamic dates that they’ve filled in themselves and marked as happy or sad. And do you have dads who sometimes forget and plan meetings and trips on important Islamic dates? Well get them to fill out the calendars with kids, that way the whole family is more attuned to important Islamic dates. Templates will be available soon. Inbox if interested. Muharram and Safar are sad months so we chose a grey background but have colorful ones for other months.